All the continental stations of the 20s and 30s relied on the fact that The British Government had no jurisdiction outside it's own land, and providing they broadcast legally under another country's law, there was nothing the British authorities could do. In reality all a broadcaster needed to do was move a transmitter outside the 3 mile territorial limit, and they would still be perfectly legal. This fact was recognised as early as 1928 when The Daily Mail planned to broadcast from a yacht (the Ceto) in international waters. Their attempt was not successful, as the equipment they installed was not suitable for marine use. Following the war the US used ships to broadcast The Voice of America in the China, and Mediterranean seas. It was not until 1958 that any non-government stations started broadcasting from international waters, when a group of Danish businessmen set up Radio Mercur broadcasting pre-recorded programmes from a small ship anchored near to Copenhagen. This station was immediately popular with listeners, and soon started broadcasting to Sweden as well. The success of Radio Mercur led to other groups starting similar ventures. 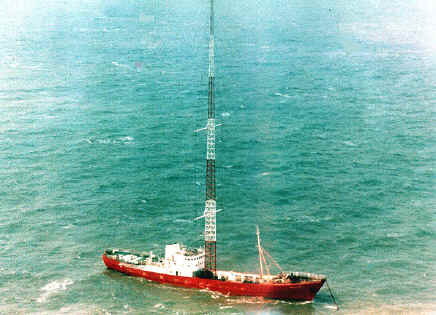 In 1960 Radio Nord converted a cargo ship, the Bon Jour, into a well equipped radio ship. The Bon Jour anchored off Stockholm broadcasting Radio Nord. Also in 1960 a group of Dutch businessmen set up Radio Veronica broadcasting from an old lightship anchored off the Dutch coast. The organisation of this station was very poor at first, and it soon got into financial difficulties. New investors decided to try selling air-time to an English organisation and early in 1961 English programmes were heard under the name CNBC (the Commercial Neutral Broadcasting Company). Due to Radio Veronica's low power transmitter, reception in the UK was restricted to the east coast and the broadcasts were not very successful. Radio Veronica continued in Dutch, and was to become extremely successful in Holland. People in Britain at last began to realise the potential of offshore broadcasts, and plans for British stations began to emerge. The first serious attempt was in 1961 when a group under the unlikely name of The Voice of Slough planned to broadcast from a ship anchored near to Southend. This station received much press coverage, but failed to appear. In 1962 a second station GBOK was then planned by some of the people involved with the Voice of Slough. Programmes were to be recorded in a studio in Notley Abbey. A ship was obtained, an old wooden lightship, and it is said that some programmes were actually recorded. The ship got stuck in the mud in Pitsea in Essex, and the project ran out of money. Around this time the Scandinavian governments decided to act together and try to outlaw the stations operating around their coasts. The law meant that it was virtually impossible to run an offshore station as a commercial operation, and Radio Nord decided to close down. Australian Alan Crawford, a music publisher in London, became interested in offshore radio, as he thought he would be able to use such a station to publicise his music. He started negotiating with Radio Nord, who were looking for a buyer for their ship. Crawford realised the only way to succeed was to obtain a large amount of funding, which he set about doing, and by the middle of 1962 it looked as though his station would soon be on air. In August the Danish authorities boarded one of the Radio Mercur ships which had re-started broadcasting, even though the ship was anchored in international waters. This action was not contested legally, as the ship was not registered and was itself illegally flying the Lebanese flag. It did, however frighten many of Crawford's potential investors who pulled out leaving the Australian's project hanging in the balance. In 1963 Irish record promoter Ronan O'Rahilly had been trying to get airplay for some of his artists, and was frustrated that all the programmes on Radio Luxembourg were sponsored by the major record companies. This meant that no independent record labels got any radio exposure on Luxembourg. The BBC only had one programme a week, the top 20, which by it's nature was unlikely to feature unknown artists. O'Rahilly had met Crawford, and persuaded him that Ronan's wealthy father would be interested in investing in Crawford's venture. Crawford provided the O'Rahillys with his research data, and Ronan immediately used it to find investors for his own station. Crawford was led to believe that O'Rahilly's station was to broadcast to the North of England, allowing Crawford's to have the lucrative south east market. O'Rahilly purchased a Danish passenger ferry the Fredericia which was converted into a radio ship in Greenore in the Irish Republic, a port owned by Ronan O'Rahilly's father. 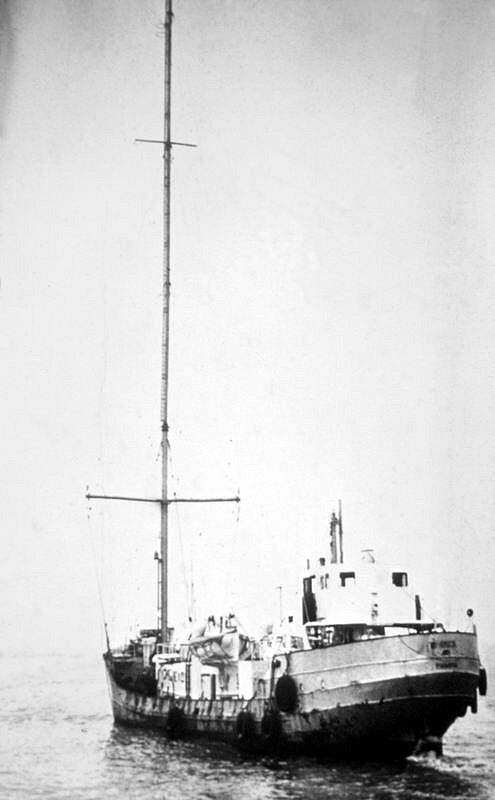 Crawford eventually got enough investment to purchase the Radio Nord ship, however in the mean time, the transmitting mast had been removed as the ship (now renamed the Mi Amigo) was to be converted to a luxury yacht. The ship was moved to Greenore for a new mast to be fittted. There then followed a bizarre situation where the Mi Amigo lay alongside the Fredericia in Greenore whilst both ships were being fitted out. The Crawford organisation found that the port workers frequently held up work on the Mi Amigo, and consequently the Fredericia was completed first. To Crawford's horror, O'Rahilly's ship sailed to the Thames Estuary, and started broadcasting to the South East. Radio Caroline thus became Britain's first offshore pirate opening on Easter Saturday 1964. It was followed a month later by Radio Atlanta from the Mi Amigo which anchored within sight of Caroline, 4 miles off Frinton-on-Sea in Essex. Barely a month after that Crawford and O'Rahilly buried the hatchet, and the two stations merged on July 2nd. The Mi Amigo became Radio Caroline South, and the Fredericia (now renamed the Caroline) sailed to the Isle of Man, where it became Radio Caroline North. In their first 10 days of broadcasting Caroline received over 20,000 letters from well wishers. Britain had it's first all day pop music station, and the listeners loved it. Not surprisingly, the authorities were very hostile to these new stations. There was talk in the House of Commons of jamming Caroline. In reality, however, an Election was looming so the Conservative government was reluctant to take action against the new stations which had become immensely popular. The Royal Navy dispatched HMS Venturous which came alongside asking for permission to board, however a live commentary of their activities was broadcast over Caroline and when permission was refused the Venturous sailed away and Caroline continued defiantly. 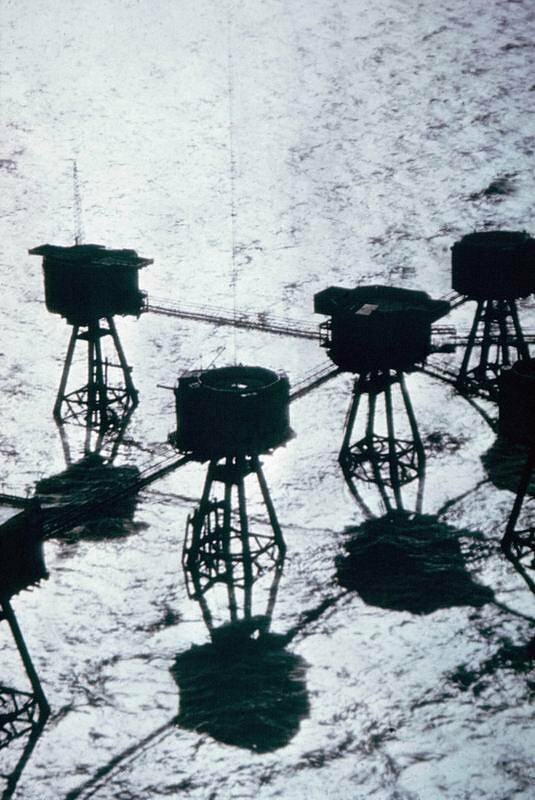 Setting up an offshore radio station on a ship was an extremely costly affair, however there were several abandoned WW2 army and naval forts in the Thames estuary. In May 1964 "Screaming Lord Sutch" set up Radio Sutch on the abandoned fort at Shivering Sands. Although very low power, and with amateurish presentation, it became popular with many teenagers. The War Department made several blustering statements claiming Sutch was trespassing, and a boarding party was sent out to regain control of the fort. For some unknown reason the boarding party was ordered to turn back before reaching the fort. No matter how angry the authorities were, they were obviously very scared of the power these popular stations held. With the government inaction, more and more stations appeared on ships and forts around Britain. The government did manage to pass some legislation against the fort based stations when in September 1964 the Thames Estuary was reclassified as a bay, allowing most of it to become territorial. As a result, all but one of the fort based stations found themselves within British jurisdiction. The authorities, however, did nothing with their new powers, and all the stations continued to broadcast. The vast money making potential of offshore radio came to the attention of a group of Texan businessmen soon after Caroline appeared. They knew they could do better, and in December 1964 the former US Minesweeper Galaxy anchored near to the Mi Amigo. Immediately this new station, Radio London, proved a big hit with it's slick American style programming. By 1966 listeners in the south east had the choice of Radio Caroline South, Radio London, Radio City, Radio 390, Swinging Radio England and Britain Radio. In the north were Radio Caroline North and Radio 270, and Scotland had Radio Scotland. More stations were planned, and all the government did was talk. In spite of the obvious demand for pop music, the BBC did very little to fill this hole and independent research indicated that over 20 million people regularly tuned to the pirates, so silencing them was going to be extremely unpopular. The Postmaster General at this time was Tony Benn, who admitted to listening to the pirates. Complaints of interference were received from countries who's frequencies were being used by the pirates, however many years later when 'secret' information was released under the 30 year rule, it transpired that these complaints had been requested by the British government! Many of the pirate DJs were becoming household names. The original Caroline DJ, Simon Dee even had a highly popular TV show on the BBC. Other pirate DJs who were popular at this time included Kenny Everett, Tony Blackburn, Dave Cash and John Peel. Pop record sales were huge, and many pop stars (including the Beatles) openly supported the pirates. Caroline and London were making massive profits with over 8 million listeners each, but the smaller stations were merely surviving financially. Radio City, which had replaced Radio Sutch, started negotiating with both Caroline and London to join forces with one or other of the stations. During these negotiations a transmitter was loaned to City by a group linked to Caroline, but when they discovered about the Radio London connection they pulled out and demanded their transmitter back. Things got nasty when Radio City's fort was boarded in the middle of the night and the station was silenced. The Police claimed they could do nothing, as the fort was in international waters. On June 21st 1966 Radio City's owner, Reg Calvert, visited the home of Major Oliver Smedley, who was behind the boarding. In a rage, Calvert became threatening, and Smedley shot him dead. The honeymoon was over, and the new Postmaster General Edward Short immediately pushed through legislation making it illegal for British citizens and companies to work for, supply, or advertise on an offshore radio station. While the bill was going through parliament, the Post Office summonsed all the fort based stations for broadcasting without a licence. The authorities now decided to use the powers gained in 1964 putting the forts within territorial waters. After long court battles all the stations were forced to close. Two forts remained in international waters, and one of these became the place of violent battles, as two stations vied for control. The other was blown up by the British Army in 1967. The new anti-pirate legislation became law on August 15th 1967, and all the stations except Radio Caroline closed down, knowing they could not survive financailly. On the Isle of Man, the Manx government tried to avoid the new law being imposed by Westminster, and a bitter battle ensued. They were forced to ratify the law which came into effect on the Isle of Man two weeks after the mainland. The Government had been concerned about the public reaction to the banning of the pirates, and decided the BBC should start a replacement pop service. Radio 247, as it was to be called, was to copy the pirates in terms of programming, and employ many of the former pirate DJs. When it opened on September 30th 1967 the new BBC pop station, named Radio One, shared 247m with the replacement for the Light Programme, Radio Two. It was an uncomfortable arrangement, brought about by the so called needle time restrictions. This agreement limited the amount of recorded music the BBC could broadcast. As a result Radio One would broadcast for a few hours, then it would be replaced with Radio Two, and various BBC orchestras performing light music. The total time allowed for commercial records was just 7 hours a day shared by the two networks. In spite of this, the station which had modeled itself on the pirate Radio London, became very popular. The only competition at this time was Radio Caroline, which was being used by it's manager to plug dreadful records released on the Major Minor label which, coincidentally, he owned. The DJs on board at that time included Johnny Walker, who complained bitterly about being forced to play uncommercial sounding records. The money from the sales of Major Minor records was not put back into Radio Caroline, and the station started to build up massive debts with the Dutch shipping firm who serviced their ships. By March 1968 this debt had reached £30,000, and the Dutch company decided enough was enough. In the early morning of March 3rd the two Caroline ships were boarded, and towed to Holland where they were impounded until the bills could be paid - they never were. The vacuum left by the passing of Caroline, and the limited pop output on Radio 1, was to be the catalyst for a whole new wave of pop pirates. 1968 didn't mark the end of offshore radio around Britain. In 1970, a Swiss owned station Radio Nordsee International (RNI), which had started broadcasting off the Dutch coast in English, moved their ship, the Mebo 2, to Caroline's old anchorage. Astoundingly, the British government actually jammed RNI for several weeks forcing the ship back to the Dutch coast. There things didn't get much better, and the Mebo 2 was fire-bombed by the rival Radio Veronica. In 1972 the two much vandalised Caroline ships were put up for auction, and purchased by scrap merchants. However the Mi Amigo was rescued from the scrap yard and, after being made roughly seaworthy, she anchored off the Dutch coast. Miraculously, Radio Caroline was heard again at the end of the year. After a disastrous period of erratic broadcasts, dogged by technical problems which included the collapse of two transmitting masts, and with virtually no income, the future didn't look good. Radio Caroline decided the way forward was to subsidise their English service by selling airtime to Belgian and Dutch stations. This proved the saving of Caroline and, despite the passing of Dutch anti-pirate laws in 1974, she continued broadcasting in this way until 1990. During this period the station had many setbacks, including the sinking of the Mi Amigo in 1980, and a massive raid by Dutch officials in 1989 when much of the equipment on Caroline's replacement ship was either removed or smashed by government thugs. The final incarnation of the Caroline organisation broadcasts today, perfectly legally, on satellite from studios in Maidstone. It is interesting to note that the massive Dutch support for the offshore pirates was due to the lack of independent commercial radio in Holland - a situation which was to continue until 1993!